The AVEA 7 and 8 from Billingham are designed to carry an array of accessories such as lenses, caps, filters and even small cameras. Extending its range of premium bag accessories, Billingham has announced two new AVEA pockets: the AVEA 7 and 8. Designed to carry an array of accessories such as lenses, caps, filters and even small cameras, the padded AVEA pockets offer excellent protection and generous storage capacity. 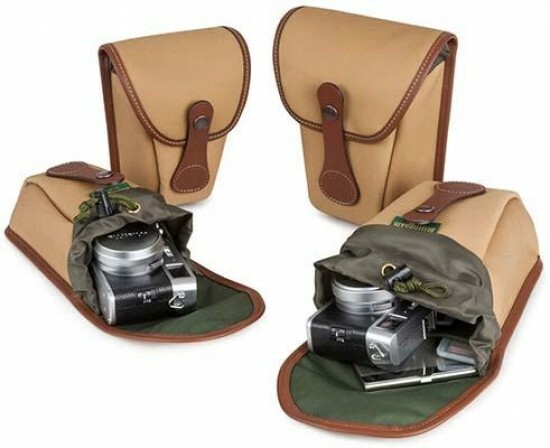 The AVEA 7 and 8 are available in Billingham’s waterproof Canvas or FibreNyte material with finest full grain leather trim, in numerous colour combinations to complement the company’s extensive bag range – and are manufactured to the same high quality standards at the Billingham factory in the West Midlands, England. The AVEA 7 and 8 are available now from www.billingham.co.uk and approved Billingham stockists at a price of £60 and £62 respectively (including VAT). For precise attachment to Billingham’s latest bags, such as the Hadley One and Hadley Small Pro, the AVEA 7 and 8 include slightly thinner straps compared to existing AVEA models. Offering a larger internal capacity, they also feature a brand new curved design. An easily-accessible internal pocket allows storage of small items, such as memory cards, lens cloths, and more. As with all AVEA accessories, they can also be securely attached to a belt. Each AVEA pocket is padded on the sides and base with high-density, closed-cell foam and incorporates heavy-duty press stud strap closures made of solid brass. The user simply passes the AVEA’s two leather straps through the leather reinforcement patch on the side of the bag and secures them tightly with the press studs. Within the pocket is a weather-proof drawstring cord fastener and toggle lock, for added protection against the elements, dust and moisture. A nylon anti-fray lining has been stitched into the seams and the top flap’s internal leather binding. Billingham’s three-layer, waterproof FibreNyte and Canvas are both hard-wearing yet lightweight materials. They never require reproofing and remain moisture-resistant for the whole lifetime of the bag. FibreNyte is an ultra-rugged material that is colour-fast and delivers exceptional durability and protection against wear and tear. The Billingham AVEA 7 and 8 come with a 5 year manufacturer’s guarantee.